Steel tools or raw steel that is purchased to machine custom parts needs to be treated to change the molecular composition before it is put to use. Some steel is too soft and can shear off if it isn't heat treated. Heat treating can turn the steel brittle, so tempering is the final step. Tempered steel items purchased ready-made have already gone through this process, but if you have raw steel or make your own parts, you need to heat treat and temper it before it's finished. 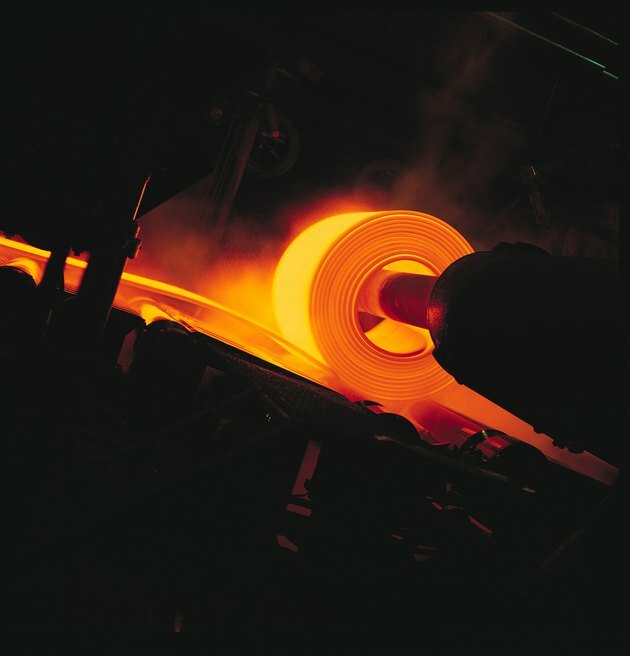 Heat treating steel is a required technique for metal workers such as knife makers. Prepare the tools for the process. The initial phase goes quickly and everything needs to be assembled within easy reach. Use a forge or small ceramic oven if possible. This starves the oxygen from the air and is a better method for the steel. If these are not available use a torch. Put on heavy gloves and safety glasses before heating the steel. Have your container of room-temperature oil or water available for cooling. Hold the metal with a pair of metal tongs. Apply the heat, either by putting the metal into the forge or oven, or by heating it with the torch. With the torch, keep the metal in the hottest part of the flame to reduce the oxygen reaching the metal. Immerse the metal into the oil when it glows a deep red. There is a danger to immersing hot steel in oil, fire is a concern. Some steel does not react to cooling in oil. In this case, switch to the water, again at room temperature. Move the steel up and down in the liquid using the tongs until the red begins to subside. Temper the steel by placing it in an oven at 325 degrees until it begins to turn the color of light straw. Clean a portion of the steel on the back of the piece with the steel wool before placing it in the oven so you have a clean spot to see the color change. Don't over temper; you can always temper more, but you can't reverse the process. Clean up the steel blade or metal part for use.